McKeesport, PA - The St. Sava Serbian Orthodox Church kicked off its 110th Anniversary with Great Vespers on Saturday evening, with the St. Sava Choir singing responses, and a dance afterwards in the hall, with music provided by Orkestrar Pobeda. Five years of planning and fundraising for new stained glass Icon-windows at St. Sava Serbian Orthodox Church of McKeesport-Duquesne came to fruition on Sunday morning, October 30, 2011, with their blessing by His Grace, the Rt. Reverend Dr. Mitrofan prior to the Hierarchical Divine Liturgy. His Grace read the prayers for the Blessing of Icons, naming all the saints represented on the beautiful windows including: Protection of the Theotokos, St. Nikolai of Zicha, Sts. Cosmas and Damian, St. Nicholas the Wonderworker, St. George the Great Martyr, Sts. 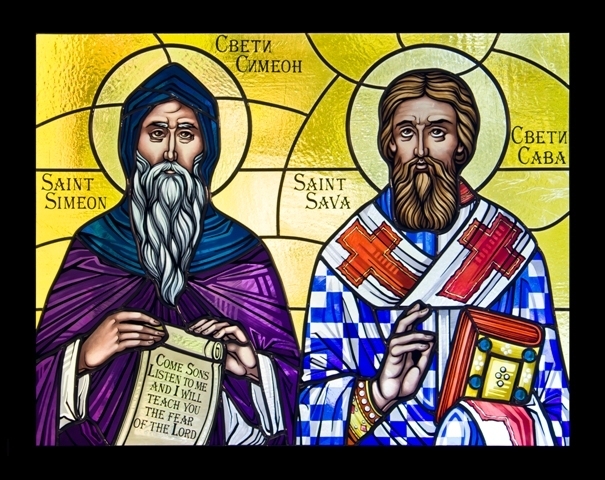 Sava and Simeon, St. Lazar of Kosovo, and St. Petka (Paraskeva) of Serbia. Assisted by the host pastor, Proto Stevan (Stevo) Rocknage, He then proceeded to bless each individual window with Holy Water. The consecration of the windows marked the 110th anniversary of the St. Sava Serbian Orthodox Church of McKeesport-Duquesne. From humble beginnings by Serbian and Russian immigrants who purchased a small wood frame church in downtown McKeesport in 1901, the dedication and sacrifice of those early newcomers flourished through the decades to the growth of the current congregation. The church commissioned Conrad Schmitt Studios Inc. of Milwaukee to design and install the windows. Meticulously designed and crafted new stained glass windows are created by CSS artists and craftsmen in a variety of styles each year. In addition to their expertise in art glass, the Studio has provided the decorative painting and restoration for some of the most beautiful churches, theatres, hotels and civic spaces in the United States. Their excellent work is truly reflected in the new windows at St. Sava Serbian Orthodox Church. In addition to His Grace, the Hierarchical Divine Liturgy con-celebrants included Proto Stevan Rocknage and his son, Reverend Christopher Rocknage, pastor at Holy Resurrection of Christ parish in Lebanon, Pa.. They were assisted by Reverend Deacon Ned Trbovich and Reader Joseph Lia. In a surpise to all, at the Little Entrance of the Divine Liturgy, His Grace Bishop Mitrophan awarded the “Right of Wearing the Pectoral Cross” to Fr. Stevo. His Grace's Proclamation, read by Fr. Christopher in church, states: "Through his zeal in the service of the Priesthood, and for his dedicated and fruitful pastoral work, for his enormous contribution and work with our youth, as well as for his great efforts and support of our Shadeland Camp, be it known that Proto-Presbyter Stevan Rocknage is deserving of the recognition of our Holy Serbian Orthodox Church. Therefore we award him with the Right Of Wearing The Pectoral Cross, trusting that this highest award of the Serbian Orthodox Church shall inspire him to continue with even greater zeal to perform such good works in the Church, for the well-being of our Church in the United States and Canada." Our St. Sava Choir broke out in a spontaneous “Mnogaja Ljeta!” and there were many tears of joy by the faithful! Bishop Mitrophan gave a beautiful homily based on the miracle of the raising of the widow of Nain’s son. He stressed the need to remember the sacrifices made by the generations before us, and exhorted us to do the same, reminding us that the light and joy of Christ is celebrated in all Orthodox churches and monasteries throughout the world. In this joy of Christ a large number of communicants received Holy Communion from His Grace during the Holy Liturgy. The St. Sava Church Choir, under the direction of Michael Vranesevich and assisted by Mary Magdic, sang the Liturgical responses. Proto Stevo gave closing remarks, welcoming and thanking His Grace for coming on this very special day to be with us. He then invited everyone downstairs to the sold-out banquet to continue the celebration in the church social hall. To begin the festivities, President Steve Kracinovsky welcomed parishoners and guests and invited His Grace to give the invocation. Orkestar Pobeda again provided traditional Serbian music during the banquet. Parishoners and guests joined in the festivities with animated conversations and laughter! After-dinner remarks were given by Bishop Mitrophan, Steve Kracinovsky, and Proto Stevo Rocknage. Proto Stevo called upon Founders' Circle sponsors of the St. Sava Window Fund to come forward and be recognized. Founders' Circle sponsors contributed $5,000 or more to the capital campaign. They included: Nick and Mitzi Pilipovich, George Pilipovich, and Cathy Obradovich. Founders' Circle sponsors who were not present at the banquet included: Dush and Jennifer Mrvos, Helen Tankosic, Dolores Hess, and the Radakovich Family. All individual Founders' Circle sponsors were presented an icon of St. Sava in gratitude for their support. The St. Sava Men’s Club and Sisterhood were also Founders’ Circle sponsors. Parish Organizations did not receive an icon. In another surprise to all, two Citations of Recognition, officially known as an "Episcopal Gramatas," were awarded by His Grace, to Danica (Dee Dee) Baskot and (Church Treasurer) James Brady. These awards are given by the Diocesan Bishop for outstanding service by a layperson in our Serbian Orthodox Church. Mrs. Baskot received the Gramata for her many good works in our parish and the Diocese and as Holy Trinity Kolo President. Jim Brady received the Gramata for his work and dedication for chairing the windows project and Parish Stewardship. All present broke out in spontaneous singing of “Mnogaja Ljeta” when the awards were presented. In another wonderful gesture, the Parish Council also recognized all organization officers and members who have been at St. Sava for 50-plus years. They were presented with a yellow rose boutonniere when they arrived at Church. In addition, everyone present at the Anniversary received an icon pin of St. Sava as a gift from the parish. The beautiful 110th Anniversary Celebration souvenir books were designed and produced by parishoners Susan Vilushis and Nancy Belich. In concluding the banquet with his remarks, Proto Stevo Rocknage said that a Bishop at the recent Pan-Orthodox Youth Council Meeting in South Carolina remarked, “Many people say that ‘the youth are the future’ of the Church. In fact, it is the other way around. The Church is the future of our youth.” As our Holy Orthodox Church continues to grow, our youth are expected to carry on the work of their parents and grandparents to preserve the Church. After Bishop Mitrophan gave the closing blessing, Orkstrar Pobeda continued their wonderful playing into the late afternoon.